Court documents released on June 8 point to a directive from then-White House operative Steve Bannon to then-head of the Trump elections commission, Kris Kobach instructing Kobach to talk with the Commerce Secretary about adding a citizenship question to the 2020 Census. The purpose was to make sure non-citizens were not counted. No mention was made of the need for the information to enforce the Voting Rights Act; the public reason giving by the Justice Department for adding the question. 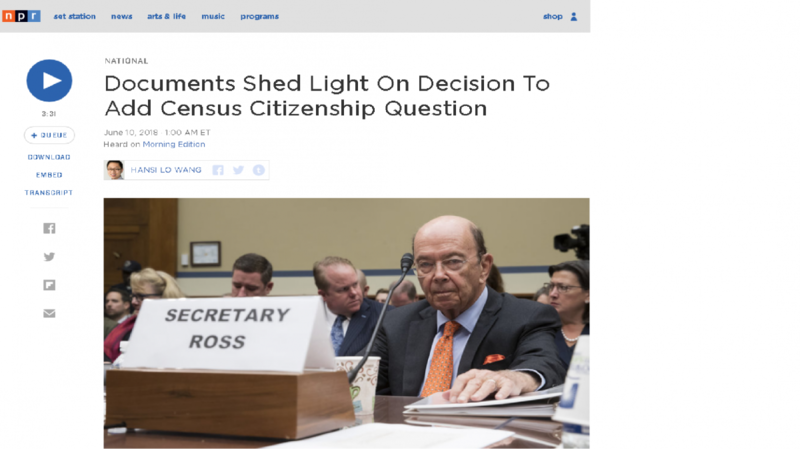 Commerce Secretary Wilbur Ross overturned the recommendation of his department's census professionals and recommended adding the question. In communicating the request, Kobach wrote that the absence of a citizenship question “leads to the problem that aliens who do not actually ‘reside’ in the United States are still counted for congressional apportionment purposes,” a claim disputed by all voter research. (Read MCF Giving Forum, "The Myth of Voter Fraud") The Constitution requires the census to count “the whole number of persons in each State” regardless of citizenship or legal status. In the 2016 case Evenwel v. Abbott, the Supreme Court unanimously ruled that states should draw legislative maps based on total population, not the number of citizens in a district. The action flies against Constitutional direction and a definitive Supreme Court decision. NPR broke the story. It was also reported in the New York Times. MCF conference keynoter, Ari Berman, reports the story in Mother Jones and ties the action to the history of partisan voting rights suppression addressed in his MCF conference remarks and his book, Give Us the Ballot. MCF opposes the Trump Administration's actions on the census as they run counter to our policy commitment to promoting prosperity through inclusion and equity by strengthening democratic systems and civic engagement, including support for a fully-inclusive, honest and accurate count in 2020. TAKE ACTION. Submit your comment to the Commerce Department opposing the addition of the citizenship question to the 2020 Census.